Ingredients (I halved the original recipe the first few times I made this to make 2 decent sized portions). that’s what’s below. Place all of the ingredients except the tofu into a food processor. Grind into a paste. Scrape paste into a gallon sized ziploc bag. 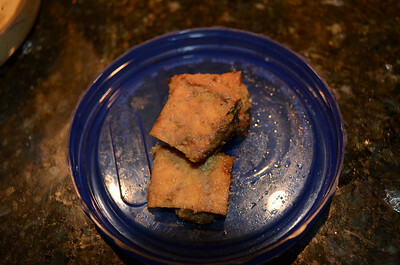 Chop tofu into small pieces–2″ cubes. Refrigerate tofu in bag for a few hours–min 2 hours. overnight probably would be even better. When it’s marinaded sufficiently, drizzle a little olive oil into a large skillet. heat. add tofu and marinade. cook until brown on all sides. (you can bake per other recipes, too). enjoy. I paired this with a mango salsa. This entry was posted in main dish, Recipes, side and tagged jamaican jerk, spicy tofu, tofu, vegetarian. Bookmark the permalink.